Clean any area that you plan to touch up. 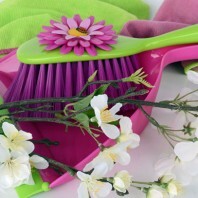 Vacuum cobwebs and wipe down the area with a wet towel (note: be sure it is free of lint). Double-check that you have the correct paint colors or choose new ones. Increased daylight means that you can see more flaws that you didn’t notice in the winter. Be sure to do any required maintenance prior to painting, such as filling nail holes, smoothing out surfaces, and sand any raised portions of the walls. Though homeowners can choose to tackle interior paint projects in Winter, Spring allows for warmer weather, which means that paint can adhere and cure better. It also means that windows can be left open for ventilation. If you are feeling a hint of Spring Fever, contact Sierra Precision Painting to help you enliven your living space.